The McDonnell Douglas MD 902 Explorer was the first helicopter produced by the McDonnell Douglas aviation company. 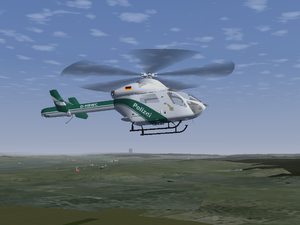 It's main role is that of a light twin helicopter, but it is used by Police and as an air ambulance. The first flight of the MD 902 in the real world was on the 18th of December, 1992. This page was last modified on 16 July 2016, at 17:04.